When some of working surface is quite hard to reach by human hands, nothing can be workable at all until users are getting the chance to make use of a high brightness pro red line laser alignment. On basis of its high brightness red laser beam emission from 635nm red laser diode, and good equipment with excellent thermal emitting system of metal heat sink cooling system, this laser line generator is easily getting quite nice thermal emitting, and maintaining highly stable red reference line targeting in long term use. Once red laser beam is pointed from 635nm red laser diode, it is getting at least 5 times brighter laser light than same output power made 650nm red laser module device. According to the selection of wide output power range of 5mW to 100mW, pro red line laser alignment is just workable at quite long work distance and high lighting working occasion etc. This 635nm red laser module is keeping the generation of high purity red laser light from laser beam aperture. In addition, according to quite special laser beam mode of TME00, whatever kind of working surface, this laser line generator is gaining quite nice quality and high straightness red reference line targeting in distance. Whatever kind of working surface, pro red line laser alignment is always getting the best quality red reference line targeting in distance. 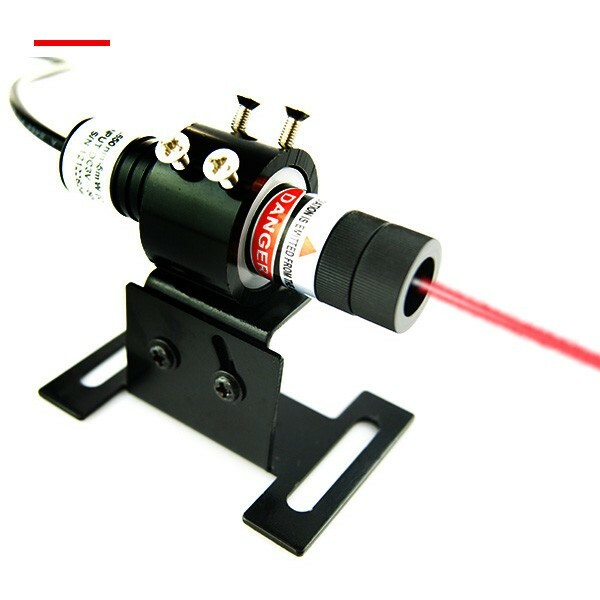 At about 10cm distance from laser beam aperture, red line is only available with super fine line thickness of 0.3mm, while red reference line is only 1mm to 2mm at about 2 meters work distance. Once users are trying to get the highest level of accuracy line targeting in distance, this red laser module should only be equipped with excellent quality separate crystal lens. No matter plastic coated lens or separate crystal lens is being used, pro red line laser alignment is getting superior high quality red line in distance. Red reference line is always available with super high linear quality. According to the special design of glass window in front of laser beam aperture part, once line aligning work is processed under moisture or dust working condition, it is still able to work with super clear line instruction in distance, and maintaining various kinds of harsh working occasions as well. When there is enough time leaving for laser module tube cooling down, after constant laser line alignment within 8 to 10 hours per day, this laser line generator is just getting super nice laser light cycling use, and extremely long serving lifetime of more than 8000 hours. According to proper wearing of 635nm wavelength preventing laser safety goggles, a high power laser line module device is still able to work with the most secured line instruction on all working surfaces effectively. In various precise device manufacturing work fields, it is never an easy work for users to get quite clear and accurate enough line instruction on all targeting surfaces effectively. However, once the real line measurement work is processed with quite advanced red line laser alignment, only if it is getting constant electric power source from DC input power supply, it will make prompt line alignment on all working surfaces effectively. When red laser module is getting easy installation and adjustment of red reference line targeting direction, it will easy get no mistake line instruction on desired working surfaces effectively. Before the use of laser line alignment work, majority of users are using quite simple blocking board, square meter or triangular meter etc, however, it is quite hard to get high efficiency line targeting on desired working surfaces. In order to avoid mistake caused by manual operation, once the real line aligning is processed with a red line laser alignment, after its selection of correct output power and optic lens degree, it will make super accurate and quick line instruction on any targeting surface. The real laser line targeting is also not limited by real work distance, height, corner or others. Noncontact red alignment laser line targeting is able to work at quite long distance, high lighting and other hard reaching places etc, thus becoming a quite popular line measuring tool for all kinds of industrial and high tech work fields etc. The front part of red line laser alignment is being equipped with glass window, together with internal glass coated lens or separate crystal lens, red line laser alignment is always getting quite high linear quality red reference line on any targeting surfaces. Even though line targeting work is processed under quite harsh working occasion, such as moisture or dust working condition, laser line generator is not affected, but just keeping good laser light cycling use, and achieving extremely stable red laser line targeting in long term use. According to real working condition, such as work distance, height, and other lighting working occasions, red line laser alignment is getting free selected output power and optic lens degree, and then making sure of clear enough line instruction on all targeting surfaces. Once users are making line targeting with quite high power red laser module up 50mW to 100mW, it will generate super intense laser beam and thermal energy, thus it is a key point to wear proper 650nm wavelength preventing laser safety goggles and avoid eye exposure, and then achieving high security line alignment on all targeting surfaces marvelously. If there is serious need of high level of accuracy line targeting in need for current industrial precise device manufacturing works, it is not a hard work for users until getting the chance to make use of a quite high brightness pro red line laser alignment. When it is keeping generation of high purity and high brightness red laser beam from laser beam aperture part, this direct diode emission made line laser module is just able to work with super clear and bright red reference line targeting in distance. According to the selection of correct output power and glass coated lens degree, this red laser module will always get efficient line instruction on all targeting surfaces. According to the selecting output power of 5mW to 100mW, Pro red line laser alignment is generating highly visible and bright red laser beam at several miles far away. It is getting quite low laser beam divergence of less than 1mard, even though the real line aligning distance is quite far away, it is still keeping super low laser line thickness. For instance, red alignment laser line is only keeping as fine as 1mm to 2mm at about 2 meters. This laser line generator is not adjustable focus. If there is strict need of beam focus distance, users should just make enough communication with laser tech engineer. After quite easy screw of laser beam aperture part, red alignment laser line thickness can be freely adjusted, and then getting quite satisfied line instruction in distance. In various kinds of industrial precise device manufacturing work fields, pro red line laser alignment is always required to generate super accurate line source in distance. In order to avoid laser light decay or blur, this red laser module is giving up the use of simple plastic coated lens, but adopting higher quality glass coated lens or separate crystal lens. Red alignment laser line is just available with super high linear quality and high line straightness. 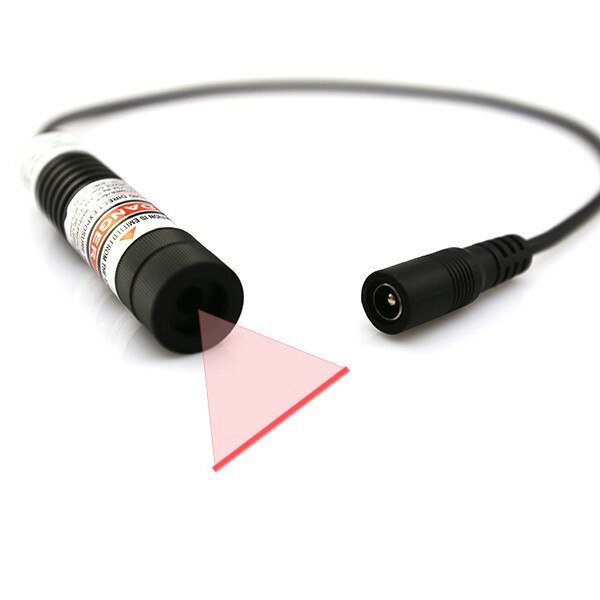 When red line length is available with different line length from 0.5 meter to 6 meters, it has just made this red laser module workable for various kinds of work fields. In order to get quite clear line instruction, pro red line laser alignment is always getting quite easy use after its operation with a laser alignment mounting bracket. Owing to its durable structure design with aircraft used aluminum alloy housing material and copper made laser diode core part, this red laser module is always getting excellent thermal conductivity, and keeping the most stable line instruction within wide range operating temperature. Whenever high intensity red laser light is generating, besides its long distance line targeting, it is also in need to take active measure, such as wearing proper laser safety goggles, this laser line device will always get no mistake and no danger use perfectly. When users are not able to find a quite efficient line alignment method immediately, nothing would be much more effective for users than the use of red line laser module. On basis of its high brightness red laser beam emission from laser beam aperture part and good linear quality red reference line targeting from its qualified optic lens degree, this laser line generator is always keeping high fineness red laser line targeting on all desired working surfaces. Only after quite easy connect with an external DC input power supply with correct operating voltage, this red laser module is just making sure of high speed and high accuracy line alignment immediately. The whole process of laser line alignment with red line laser module is not the same as any other manual line drawing tool. Anyway, when line aligning is processed with high level of accuracy and at quite longer work distance, nothing of manual line aligning work is able to fulfill the need. However, supported by external DC input power supply, this red laser module is easily obtaining constant red reference line targeting. It is always keeping constant output power and electric current supply from laser beam aperture part. Although this laser line generator is not adjustable focus, however, users can still make quite easy adjustment of laser beam aperture part to get different line thickness in use. Under condition that red line laser module is equipped with glass coated lens or separate crystal lens, no matter what kind of targeting surface, it is just easily keeping high linear quality red line emission immediately. When line alignment is processed at much longer distance of 2 meters, the fineness red line can be only 1mm to 2mm line thickness, while the finest line thickness is only 0.3mm at about 10cm work distance from laser beam aperture part. Owing to its good use of import red laser diode, under correct use by professionals or skilled users, this laser line alignment tool is easily obtaining high level of laser beam ability, and then making sure of the most stable red line targeting in long term use. Whenever red line laser module is being used in those of industrial precise device manufacturing work fields, it is always used as an accessory part, but not able to be used separately as a simple laser pointer or laser pen etc. This alignment laser is also able to be installed on any other industrial machine or device. Once it is pointed on those of hard reaching place, noncontact red laser line is still able to be adjusted within three dimensions, and then achieving the highest level of accuracy line alignment all the time. How would you like to do to get extremely long line length in distance? Once you are feeling quite difficult to get extremely accurate line alignment in distance with required of long line length, it is also not a kidding job for users to still use simple manual line drawing tool, such as a square meter, blocking board or others. IN order to get ideal line aligning length, it is just a very nice chance for users to use 110 degree glass coated lens equipped red line laser alignment. Whenever red alignment laser line is pointed in distance, it is just clearly showing with high linear quality and high level of laser light transmittance. Only if this laser line generator is correctly installed and adjusted, it is easily obtaining a no mistake and high speed line instruction on all desired working surfaces effectively. The design work of 110 degree glass lens made red line laser alignment is a bit different from formally used dot aligning tool, which is generating even more complex laser beam in type of a highly straight red reference line in distance. It is employing high quality red line, which is able to obtain extremely long line length of 6 meters at about 2 meters work distance from laser beam aperture. This laser line generator is available with quite wide range output power from 5mW to 100mW, besides its close distance laser line targeting, it is also workable for quite long distance, accepting fine and clear red reference line targeting within maximum work distance of 25 meters. No matter what kind of targeting surface, this 110 degree red line laser alignment is always used as an accessory part, which is adopting 16mm or 26mm diameter tube diameter design. It is quite similar with a red laser pen. In addition, owing to its special design of electric wires connecting both red laser module and DC input power supply, it is freely installed with wide range distance of 0.5 meter to 3 meters, and then achieving the most convenient installation and adjustment until getting the best laser line instruction as expected. When red line laser alignment is workable for multiple work fields, it would also have to maintain stable enough line instruction in those of harsh working environments, such as military targeting work. According to its durable structure design with aircraft used aluminum alloy housing material and copper raw material made laser diode core part, this laser line generator gets superior nice thermal conductivity, and then achieving stable enough red alignment laser line targeting in long term use. Anytime this red laser module is workable with quite high power, it will generate quite powerful laser beam and thermal energy. Only if users are remembering to wear proper laser safety goggles, this laser line device gets the best line instruction perfectly. Have you ever fallen into serious difficult to make accurate enough line aligning at quite long work distance? It is not an easy job for users until getting a quite nice and professional line measuring tool such as a red line laser alignment. The real experience with red laser module is also not the same as any other manual line drawing or line printing device, anyway, once it is getting connection with an external DC input power supply with different operating voltage of 3V or 4.2V, this laser line generator is just obtaining highly straight and fine red reference line on different working surfaces effectively. The use of red line laser alignment is not the same as any other manual line drawing tool. When it is available with import 650nm red laser diode, owing to its wide range output power from 5mW to 100mW, red laser line is clearly visible and bright at quite long work distance. It is not only able to work with clear line instruction for formal hand reaching, but also workable for super clear line targeting at quite long work distance and high lighting working occasion as well. Once red laser beam is pointed under sunlight, none of laser light can be observed by human eyes. Users should just avoid such kind of working environment, a correct output power made laser line generator is just easily obtaining clear enough line positioning result effectively. Owing to featured advantages of good direct and high brightness, red line laser alignment is just getting super wide applications in majority of machinery processing work fields. In order to make sure of clear and quick enough line targeting on different working surfaces, this red laser module is just employing qualified glass coated lens or separate crystal lens as its laser line emitting source. No matter what kind of targeting surface, red reference line is just available with quite high linear quality. No matter long distance or long term continuous line targeting work, this red laser alignment is always assuring high linear quality line targeting on required working surfaces. No matter what kind of industrial precise device manufacturing work fields, this red line laser alignment is also very small designed, while still workable with quite nice thermal emitting system of a metal heat sink cooling system and APC driving circuit board. Users are just operating this alignment laser as a very nice and helpful accessory part, only after its proper adjustment of red reference line targeting direction and line thickness, users are easily obtaining high level of accuracy line alignment excellently.